Howard Kroplick (foreword by Florence Ogg). Vanderbilt Cup Races of Long Island. Charleston, SC: Arcadia Publishing, 2008. 128 Pp. Photographs. ISBN: 073855751X. $21.99. Despite its occasional reputation as a highway with shopping malls, Long Island is a place rooted in a history both fascinating and varied. One strain of that history concerns the first international auto races in this country, the Vanderbilt Cup Races, as well as the innovative road which was partially an outgrowth of these races, the Long Island Motor Parkway. Each of these subjects finally get their due in these two fine books. The brainchild of William K. Vanderbilt (grandson of Cornelius Vanderbilt, the railroad magnate), the races took place between 1904 and 1910 on Long Island. “Willie K.,” as he was known, was obsessed with the idea of fast cars, and sought to present a venue in which American cars might be raced against those of European manufacture, thereby testing their mettle and encouraging the development of American cars of excellence. He gathered about him other racing enthusiasts, and backed the endeavor with his personal fortune. The first race was held on October 8, 1904, on public roads, much to the chagrin of local farmers who were unable to use the roads to bring their goods to market. Spectators, numbering between 25,000 and 50,000, thronged to Queens and western Long Island to view the race. Such a thing had never taken place in America. Author Kroplick has obtained actual movie footage of the race in his private collection and it shows the crowd taking over the roadway and moving back as the cars come through, then back into the road again. This made the race extremely treacherous for both participants and spectators, but added to the excitement. The Brooklyn Daily Eagle covered the event exhaustively, and sold a scrapbook that buyers could fill with clippings from the newspaper and photographs of the competing automobiles which were available for purchase (the Smithtown Library’s Handley Collection possesses one of the few surviving copies of this scrapbook, filled for Arthur Pardington who worked closely with Vanderbilt on the races and served as General Manager for the construction of the Long Island Motor Parkway). The races continued in 1905 and 1906, but in the latter year a spectator’s death caused Willie K. to decide to build a limited access paved roadway on which to run his race. There was no race in 1907, but the 1908 event, the first won by an American driver, was run partly on public roads and partly on the still-being constructed Long Island Motor Parkway. The last races held here were in 1909 and 1910, attended by over 250,000 spectators, after which the Vanderbilt Cup Races moved from New York to other locations and Willie K.’s interest in them waned. 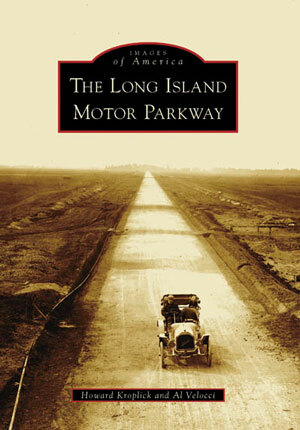 The Long Island Motor Parkway was basically completed by 1910. It continued to serve as the first limited access paved toll road in the country, with drivers making use of it until the late 1930s, when its right-of-way was sold to Nassau, Queens and Suffolk Counties for back taxes. Parts of it were incorporated into Robert Moses’ parkways, parts were lost, and parts are being uncovered today by the vigilant efforts of devoted fans of the era when cars were new and speed was king. These two books have been published by Arcadia Publishing Company, which has a set formula for content and layout patterns, and produces affordable books that bring local history to life through photographs. Kroplik’s The Vanderbilt Cup Races of Long Island (with a foreword by former Vanderbilt Museum archivist Florence Ogg) is organized into eight chapters, which detail William K. Vanderbilt, setting the stage for the competition, individual races, and one chapter describing the need for and construction of the Long Island Motor Parkway. The details are interesting but do not overwhelm and there is enough description accompanying each photograph to give the reader a balanced sense of clarity and knowledge. The Long Island Motor Parkway is a collaborative effort between Howard Kroplick and Al Velocci. This book covers its complex subject quite exhaustively despite the confines of the Arcadia format. The need for the Parkway is discussed, along with the establishment of the corporation that oversaw its construction, and the ground-breaking ceremonies are detailed. Then its construction and its use for the races are covered. The parkway’s life after the Vanderbilt Cup Races takes up most of the rest of the book, with a final chapter devoted to memorabilia. One leaves this book with an excellent grasp of a roadway that was a forerunner to modern transportation and the paved Long Island that we see today, as well as an understanding of a bit of how it came about and to what end. Howard Kroplick and Al Velocci are serious researchers who have devoted many hours to the mastery of their topics. Al has already published The Toll Lodges of the Long Island Motor Parkway, and Their Gatekeepers’ Lives (2004), and Howard has amassed the largest collection of Vanderbilt Cup Race memorabilia in existence, including a real auto, the Alco-6 “Black Bear,” driven in the races. He maintains a fascinating website (www.vanderbiltcupraces.com) and lectures on the races. Both these gentlemen are at the forefront of the effort to unearth the hidden parkway. They are to be commended on these outstanding latest efforts.